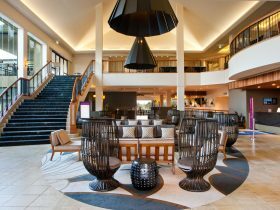 Surfers Aquarius on the beach is ideally located beachfront on the golden sandy beaches of the Gold Coast in south east Queensland. 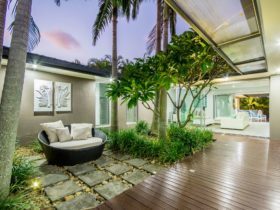 Located halfway between the centres of Surfers Paradise and Broadbeach, it is within walking distance to the world renowned Casino and the Pacific Fair Shopping Centre. 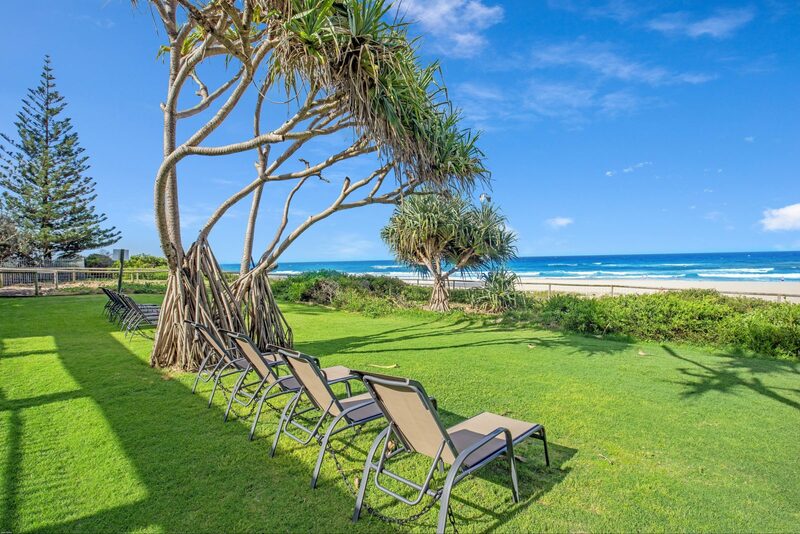 The very spacious self contained apartments have fully equipped kitchens including dishwasher and microwave, full laundry facilities, cable television, air conditioning in the superior apartments and command superb views of the Pacific Ocean and the Gold Coast hinterland. Surfers Aquarius has lots to offer. Set amid two acres of lush tropical gardens are floodlit tennis courts, fully equipped gymnasium, heated swimming pool, wading pool, play area for the children and numerous barbecue facilities. 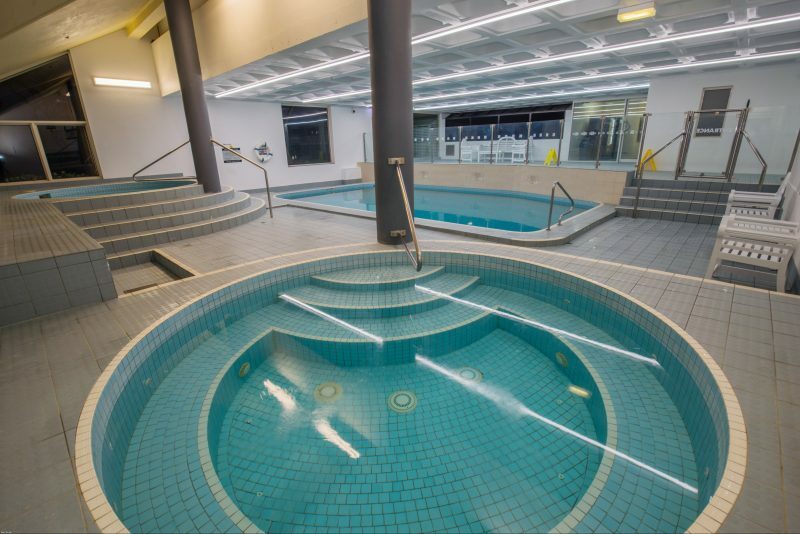 Also on offer is a heated indoor swimming pool, spas, sauna, squash court and complimentary undercover parking. 1 bedroom, 1 bathroom apartment featuring full kitchen facilities, dining & living area, laundry facilities and balcony with views of the facilities, the western skyline or river. 1 bedroom, 1 bathroom updated apartment featuring full kitchen facilities, air conditioned dining and living area, laundry facilities and balcony views of the facilities, the western skyline or river. 2 bedroom, 2 bathroom apartments featuring full kitchen facilities, dining and living area, laundry facilities and balcony with views of the facilities, the western skyline or river. 2 bedroom, 2 bathroom updated apartments featuring full kitchen facilities, air conditioned dining and living area, laundry facilities and balcony with views of the facilities, the western skyline or river. 2 bedroom, 2 bathroom apartments located up to level 10 with north western views. Featuring full kitchen facilities, dining -and living area, laundry facilities and balcony with partial views through to the beach, the skyline and river. 2 bedroom, 2 bathroom apartments starting at level 15 on the north side of the building. 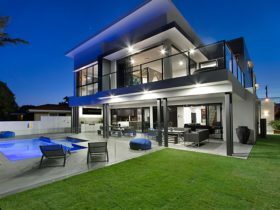 Featuring full kitchen facilities, dining and living area, laundry facilities and balcony views spanning through the towers of Surfers Paradise along the beachside towards The Spit. 2 bedroom, 2 bathroom updated apartments starting at level 15 on the north side of the building. 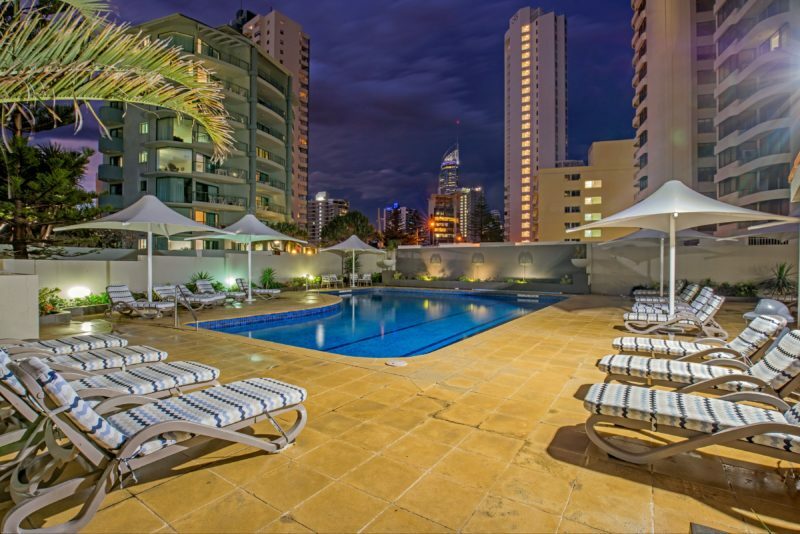 Featuring full kitchen facilities, air conditioned dining and living area, laundry facilities and balcony views spanning through the towers of Surfers Paradise along the beachside towards The Spit. 2 bedroom, 2 bathroom updated apartments located ocean facing on the front of the building. Featuring full kitchen facilities, dining and living area, laundry facilities and balcony views to the ocean. 2 bedroom, 2 bathroom updated apartments located ocean facing on the front of the building. 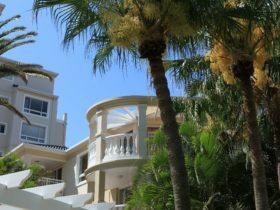 Featuring full kitchen facilities, air-conditioned dining and living area, laundry facilities and balcony views to the ocean. Fully renovated 2 bedroom, 2 bathroom apartments featuring full kitchen facilities, living and dining area, laundry facilities and balcony. Apartments feature air conditioning in the bedrooms as well as bathrooms. 3 bedroom, 2 bathroom updated apartments located ocean facing on the front of the building. Featuring full kitchen facilities, dining and living area, laundry facilities and balcony views.